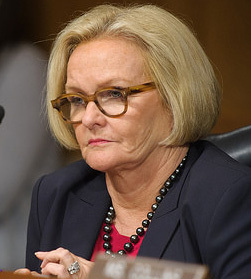 Missouri Democratic Senator Claire McCaskill is frustrated Republicans have refused to hold hearings or vote on President Obama’s nominee for the Supreme Court. After conservative justice Antonin Scalia’s death earlier this year, Obama selected appellate court judge Merrick Garland as a replacement. Over the summer, Garland, broke the 100 year old record for longest gap between nomination and confirmation of a U.S. Supreme Court nominee. So far, he’s been waiting in vain for almost 180 days. Late last week Democrats renewed their push to get a hearing for Garland when Vice President Joe Biden convened congressional party members to pressure Republicans. McCaskill says it would be the Republican majority’s prerogative to reject Obama’s nominee so long as they allowed an up-or-down vote. Missouri’s GOP Senator Roy Blunt supports his party’s call for voters to have a voice in determining the next Supreme Court justice through the presidential election.